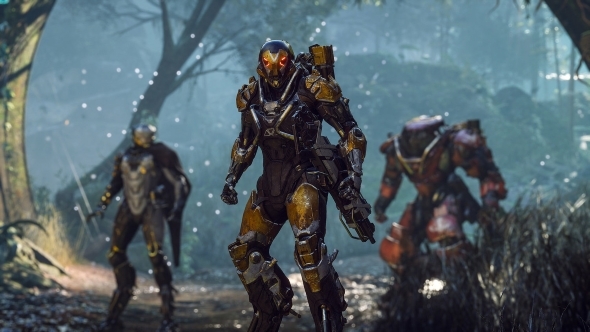 Anthem, EA’s big bet on the epic hobby game, will not have player-versus-player multiplayer. That’s a big difference from its key rivals, Destiny and The Division, which have both had a PvP mode in all their releases so far (though there’s a lot we don’t yet know about The Division 2). We’ve learned a lot about Anthem at E3 2018, and to be fair, it’s pretty difficult to see how a PvP mode makes much sense in the game’s setting so far. All player characters appear to be huddled together in a hub named Fort Tarsus, protecting themselves from the hostility of a world in constant flux. It all looks very communitarian, and it’s not clear what the excuse might be to start killing each other. For more massively multiplayer fun, check out the best MMOs on PC. The news comes via Game Informer, which published a video interview of 123 rapid-fire questions with executive producer Mark Darrah during EA’s conference. It’s an interesting move by BioWare, which seems to be positioning Anthem as the most story-rich of the big hobby games. Clearly this will limit its appeal among competitive types, but extend it toward traditional RPG fans. We just learned a lot of new stuff about BioWare’s next big game, so click here for everything we know about Anthem so far. Anthem will release on February 22, 2019 – a month earlier than the March release we last heard. Perhaps EA are keen to move it ahead of The Division 2?